Besides the sterilisation process, the premises must include a separate sink for the washing of hands. This would include for and after preparing the equipment! The 3 sinks, are a vital neccessity in the process of conducting my sterilisation. In 2012, the rules were adjusted once again for all practitioners, whereby, each packet of instruments, will all have to be "Coded" to each patient and dated accordingly to the times that they were used on each patient. We are then requested by the H.P.C. (Health Professional Council), to "Log" these codes to each patients record cards, and keep these log books for inspection by the council when needed. The law is extremely stringent, with instrument hygiene. This protection towards patients, ensures that ALL Practitioners adhere to the strict code of sterilisation. Transfer of micro-organisms or infections are not transferred to patients. 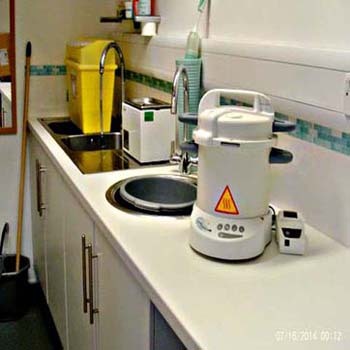 Within my surgery, I have installed 3 separate sinks, within a "Sterilisation Area", one for scrubbing instruments of initial debris and blood from the instrument. Another one has been installed for rinsing all the scrubbed instruments. Also, another sink for hand washing only. After processing, the instruments are inserted into an "Ultra Sonic Wave" cleanser, which removes any further debris that may have been missed from the manual scrubbing of the instruments. 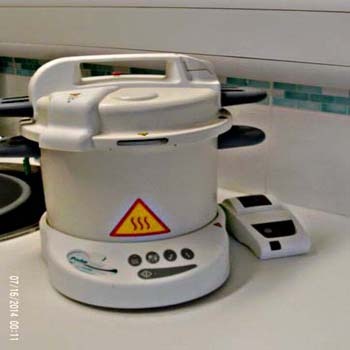 This "Cycle" will last for 30 minutes, where they are then taken from this machine, and put back into the rinsing sink and dried thoroughly, afterwards they are installed into an Autoclave machine, which will blast them for another 45 minutes, sterilising them completely. After the total cycle of the above is completed, (it takes on average around 1 and half hours of my day to complete each pack of instruments.) They are then the manually placed into individually sterile packs of around 5 to 8 instruments. (depending on the procedure that I may need to do for the day ahead), then stored within a sterile cabinet for the following day. As a patient to any Podiatrist, you are entitled to question the sterilisation process with the practitioners, to make sure that you are receiving the correct procedures in connection with "Sterilisation" process.